Angels Toruń after close game lost to Cougars Szczecin in an exciting and spectacular match. Fans also can play on inflatable big toys, with dinosaurs and kangaroo mascot and enjoy a meal on the barbecue. Already the first offensive move of the match had not gone according to the plan of Angels. Torun introduced so unfortunately the ball into play, that this came out for the end zone. The judges awarded two points for safety. 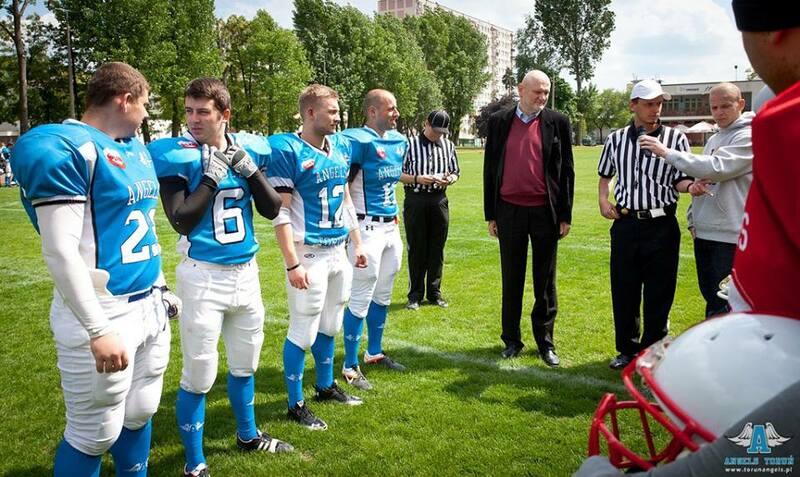 Soon Szczecin celebrated the first touchdown in the game, when Emil Trochanowicz used to pass from Andrzej Lukasik. At the beginning of the second quarter touchdown scored after another cast Adrian Rogaczewski seemed the game gets out of Angels hands. But just before the break Angels have done an effective offensive action. Łukas Kuśmirek pass to Przemysław Golebiewski and to break the visitors led eight points. In the second half of the reason to be happy Torun fans gave Kuśmirek. His two touchdowns on runs allowed the Angels go on a 4-point lead. But Cougars had the last word- shortly before the end of the game Marcin Łodygowski gave Cougars winnig touchdown and they can start celebrating the second triumph of the season. attack is jammed, but deffence gave impetus to the attack. The decisive moment made a series of successful offensive which decided the victory - commented Michałk Lukasik, Cougars Szczecin offensive coach. - This victory really means a lot to us. Triumph is very valuable, since managed to turn things around in your favor - Lukasik said. - I think that the match could to please the audience. In addition, they can enjoy the many attractions that we have prepared. Tossed a coin was made by Toruń Mayor Mr. Michał Zaleski. Unfortunately run victory today, but we presented the good side. Improving the match by match. Also the organization. Today painted field with all the details - including the numbers - said Dawid Witnik, president of Angels Torun - The end of the match we had a chance of winning. In the context of a two-point defeat hurts shares at the beginning of the match, which was costing us so much mesh - added Witnik. The clearest form of the offensive was a reciever Cougars- Emil Trochanowicz. In defense of the leading light of safety Adam Kozakiewicz. Well presented also Marcin Łodygowski. 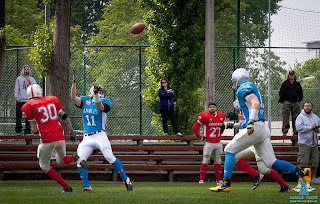 The best player in the attack was a Angels wide reciever- Jakub Mazan. 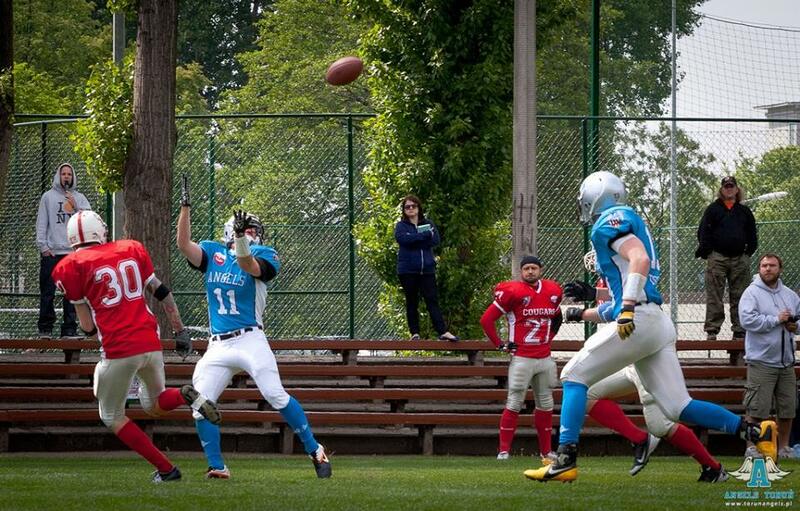 Well also played quarterback Łukasz Kuśmirek. Very well played the entire defensive line, in particular- Wojciech Jędrzejczak and Karol Kukliński. The match watched by 600 spectators.